There is a corner of Highbury and Islington devoted to pies, one that you may have heard of before because they are loved by our very own Pierateer RAS, who has reviewed a number of their pies, putting a couple of them right near the top of our pie rankings. I was delighted to finally get my hands on some of these pies which come so highly regarded, so of course I had to get a few! I got a Lamb and Veg ("Ian Wright") because this had been reviewed highly by Mr RAS. I also got a couple of pies not yet in our pie rankings, a Steak and Ale ("Tony Adams") and a Chicken Balti ("Lee Dixon"). After refusing gravy on my pie (as I wanted to experience it in the purest form) they kindly gave me a separate pot of gravy. Sadly this backfired as I suffered a gravy explosion all over my take away pies and the bag, a bit of a nightmare, but my fault for taking the pies away on my bike. 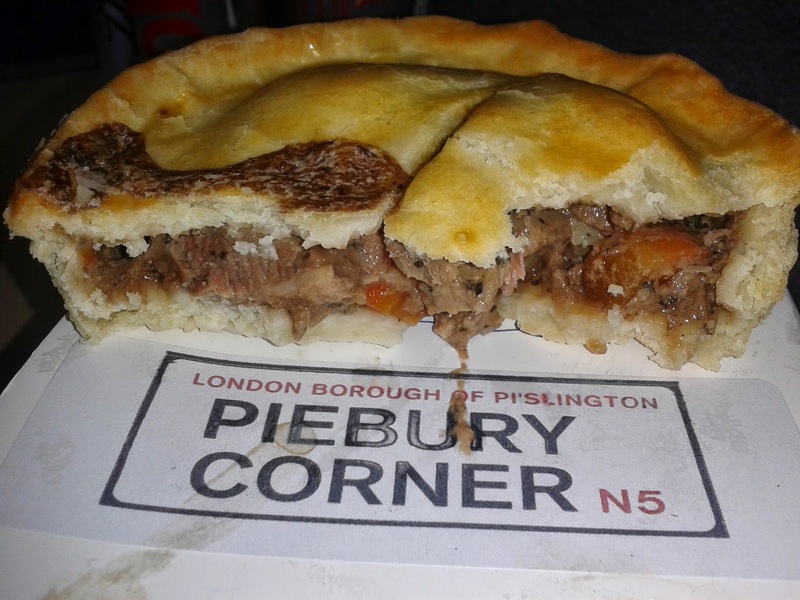 That aside, Piebury Corner seemed like a lovely little place and I was very impressed by the large array of pies on offer. These pies were all the same shape and had the same pastry so I have some general comments which apply to them all. I can see why RAS likes them so much, the pastry in particular was the kind of pastry that exemplifies what I look for in pie pastry. It was crisp on the outside but soft and gooey in the middle. It also held together really well because it was fairly thick which meant it could be eaten with your hands if desired. The pastry also tasted very nice on its own. They were all well presented with some decorative pastry features and a nice colour. The pies were completely packed with filling but with only a small amount of boil out. I think this was achieved because there wasn’t much sauce in general. However, for me there was a downside, these pies were just too shallow for my liking. They didn’t look like what I imagine the perfect pie to look like. They were quite shallow and this combined with the thick pastry meant I thought they were a bit ‘pastry heavy’ and missed the ideal pastry to filling ratio. They were also a little bit small and I could have quite easily eaten more than one in one meal (but I do really love pies). But don’t let this put you off trying these pies, they are great, I would much rather have a pie which has a smaller capacity which is packed with content than one with an airgap. 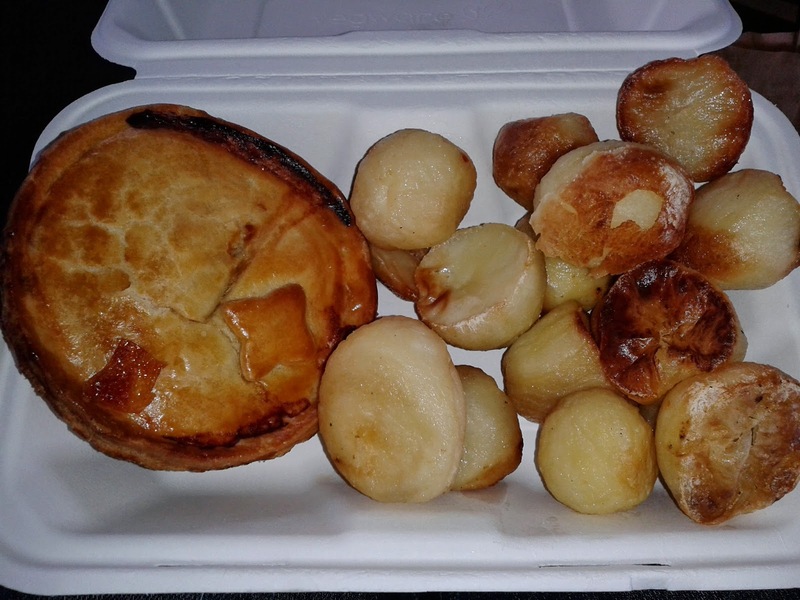 It is also nice to have a smaller pie of better quality, more isn’t always more fulfilling as I have found before… They were £3.50 cold or £4.80 hot, although the prices do vary with some of the other pies. The addition of roasties for a couple of quid more was welcome. Lamb and Veg - The "Ian Wright"
There was a great lamb flavour from this pie and plenty of pieces of meat. The veg seemed to mainly just be carrot but it was very nice and it wasn’t overcooked, which is difficult in a pie. Overall this really was delicious. See the full review by RAS. Steak and Ale - The "Tony Adams"
Condition – 5.8 out of 7 – Nicely presented although some boil out. Colour – 6.5 out of 7 – A pretty darn good golden brown. Cheapness – 4.5 out of 7 – The price was comparable to other gourmet pie companies in London such as Battersea Pie Station and Square Pie. I couldn’t help feeling though that these pies were a little small. Capacity – 4.5 out of 7 – Quite a small capacity but it was well filled. 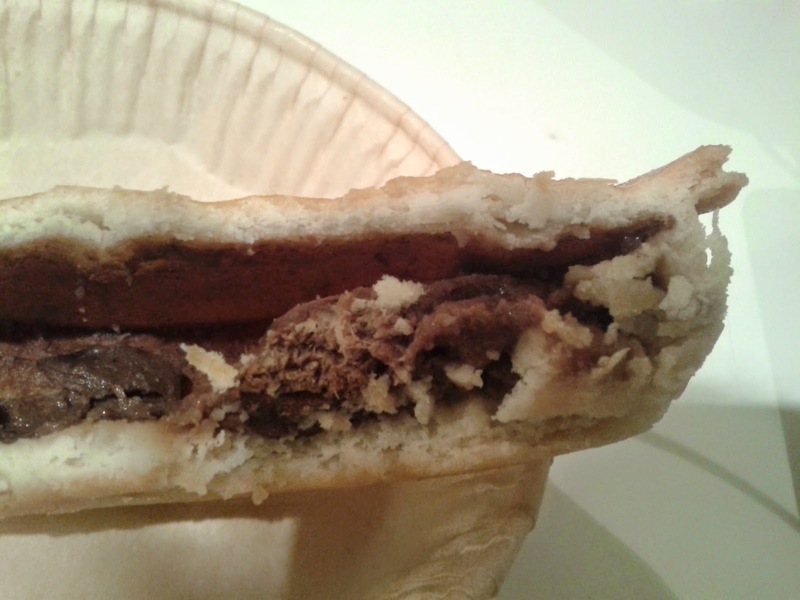 Chewiness – 6.9 out of 7 – A fabulous texture throughout the pie. Content – 6.7 out of 7 – It didn’t do anything special with the flavours but it did capture the Steak and Ale taste perfectly. There were nice meaty chunks to sink my teeth into. Some great seasoning. Consistency – 6.5 out of 7 – This pie was very, very easy to eat (although it was all gone too soon, I forgot to take a photo until I had nearly eaten it all). A little more gravy would have been nice but it was still lovely and moist. Chicken Balti - The "Lee Dixon"
Condition – 6.0 out of 7 – Nicely presented. Chewiness – 5.8 out of 7 – A fabulous texture throughout the pie. The chicken was chunky and fibrous. Content – 3.5 out of 7 – On my first bite I thought this was going to be really nice, the flavours were proper curry spices, not generic curry sauce as many curry pies have. However, after eating a bit more I found the whole thing very bland, there wasn’t enough spice for me, it wasn’t hot at all. 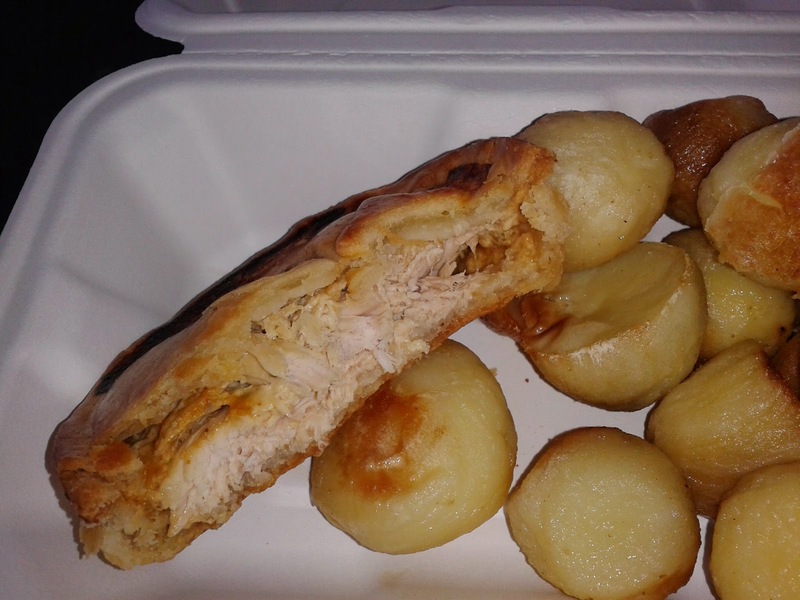 I am not sure whether my pie was just lacking any sauce as it was almost entirely taken up by pieces of chicken. This may have been where the problem was. Consistency – 3.5 out of 7 – This pie was again very easy to eat but didn’t really quite work holistically, there needed to be a bit of sauce to give it the consistency I would expect from a Balti pie which normally have plenty of sauce, like a Balti curry does.